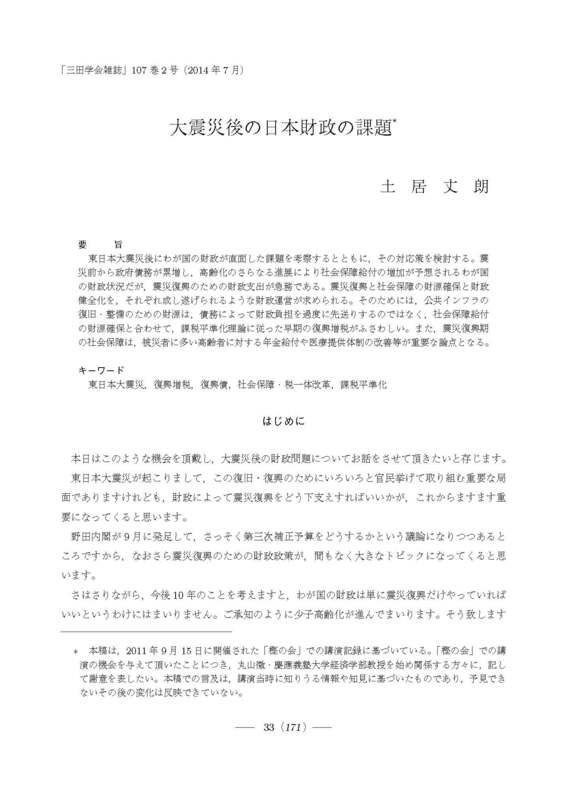 This paper investigates the issues faced by fiscal agendas after the Great East Japan Earthquake, and argues what countermeasures are possible in Japan. Although the Japanese government has a huge amount of debt before the earthquake and an increase in social security expenses due to the progression of an aging population, they do not change the fact that fiscal expenditures for earthquake recovery remains a pressing issue. A fiscal management program that is capable of ensuring financial resources and improving fiscal soundness is required. Therefore, it is appropriate that financial resources for the recovery and maintenance of public infrastructure combined with funds necessary for social security benefits are obtained by an early increase in taxes for reconstruction in accordance with a tax smoothing theory, instead of needlessly postponing the fiscal burden resulting from debt. In addition, regarding social security benefits during the earthquake recovery period, improvements, and so on, to the pension benefits for the elderly, which comprise a large number of the victims, and to the health care provision system, are important issues.